I've been having some issues with the Social site ever since its update in mid-December. If it wasn't bad enough that Social doesn't recognize half of my songs (even the ones that are tagged correctly), and only decides to register a play even more infrequently, it seems someone's punched a hole in my artist play count balloon. I'll let the pictures speak for themselves here. 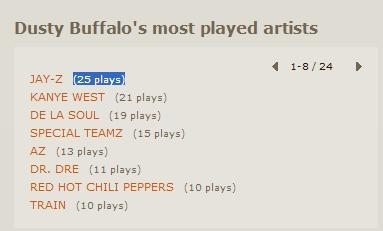 6 of my 8 most played artists were knocked out completely. I don't know if this specifically has to do with the update, because I recall having some issues before then. Sometimes playing an artist would make the play count go down, and in other cases, one play would count double. Very, very weird. Maybe this has something to do with the troubles Live and specifically Xbox Live has been having recently? Come to think of it, I might have an idea where all my plays are going... I'm envisioning a massive global conglomerate dedicated to siphoning off play counts and then depositing them in Swiss bank accounts. I mean seriously, only 5 Beatles plays? I created a forum topic about this issue, but so far I haven't received a reply. I don't think I'm the only one... I just checked Cesar's card, and it appears he doesn't have any Tokyo Police Club plays, when previously they were one of his top artists. All in all, not a huge deal. But why do I get the feeling that it only keeps the embarrassing artists?